…in coming together today, we can only give thanks for the truly remarkable strength of the Faith with which so many Christians face persecution, and which gives them the courage and the determination to endure, and to overcome. …we are living in a world in which we are frequently presented with so many profoundly disheartening news stories, yet it is important that, on a personal level, we do not lose hope. And this is why I was encouraged to see the story of Meriam Ibrahim feature in this report. Imprisoned in Sudan, pregnant, and facing a death sentence for reportedly converting to Christianity, Meriam remained true to her beliefs. It is cases such as that of Meriam, who was eventually released, that remind us of St Paul’s words, so relevant to all of those enduring persecution for their faith, that suffering produces endurance, endurance produces character, and character produces hope. And hope does not disappoint us. The future Defender of the Faith will ascend the Throne (D.V.) at a time when the people of the Faith have never been more in need of a defender, and nowhere now more so than in the Middle East. Where communities of more than a million have been systematically ‘cleansed’ to just a few hundred thousand, it is no wonder that people talk of the extinction of Christianity in the lands where the Good News was first proclaimed. The mainstream media isn’t overly interested: we might get a few column inches when an archbishop speaks. 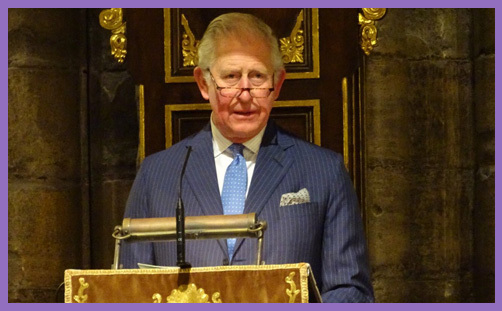 But when Charles, Prince of Wales, takes to the pulpit, the whole world hears of the historic Faith, of eschatological revelation, of apocalyptic suffering, of a man called Jesus, of the coming Kingdom, of salvation’s imminence, of hope, of peace, of reconciliation, and of societal transformation. Prince Charles has found his divine vocation and service to humanity: it is to witness to Jesus’ death on the Cross by identifying with the persecuted and reckoning with what it means to be a peacemaker; to be called a child of God. Long may he prevail.